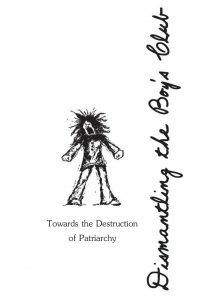 This zine is aimed towards men within the anarchist space to explain how patriarchy works and men’s role in maintaining it, both within the anarchist space and in the larger world. There are essays explaining patriarchy, discussing gender, and sexism in the anarchist space. Along with this, there is a helpful list of terminology and definitions, tips for starting a group for men against sexism, and a detailed questionnaire designed to push men towards exploring how patriarchy manifests itself in their lives. It’s one of the better and more recent zines on the topic.